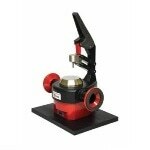 The SurveyIR is a new FT-IR microspectroscopy accessory from Czitek. A unique ergonomic design allows the operator to interact with the instrument effortlessly. 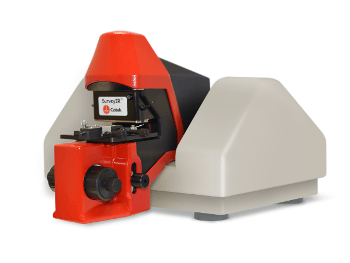 Its compact configuration and an optical design that requires no alignment makes it easy to mount it in the FT-IR sample compartment and is compatible with most FT-IR spectrometers in the market. A 5 MP color video camera with a 1900 µm field of view produces visual images suitable for research. The viewing optics have a high depth of field that helps find samples quickly and allows alignment in the reflection, transmission, and attenuated total reflection (ATR) modes. Locating samples with a traditional IR system can be difficult, but the illumination optics and the simple sample stage controls along with the high depth of field make locating samples very easy using the SurveyIR. Three on-board LED illumination modes are available (transmission, reflection, and oblique or dark field), which ensures outstanding contrast for a variety of samples. The clip-on diamond ATR provides excellent viewing quality and coupling of the sample with the ATR, making it easy to work with samples and see when the sample is contacted. Czitek’s contact alert along with the clip-on ATR checks the force constantly to ensure proper sample contact. The accessory also allows for viewing and manipulating the sample, while obtaining the spectra at the same time. The IR performance is controlled using the FT-IR’s on-board detector in the reflection, transmission, and ATR modes. The sample can be controlled by manually adjusting the standard microscope controls such as the 1 x 3 inch travel x, y stage, coarse/fine focus, and condenser focus adjustments. Image display and capture, manipulation, measurement, storage, and documentation are made easier by the new Czitek eSpot software. The software also acts as an interface for selecting the IR mode, illumination, and the sample size using six aperture settings to 60 µm. From a drop-down menu at the top of the screen, the desired mode can be selected. This makes switching between different modes of data collection or illumination very simple. Purging is done using the quick disconnect ¼” tube fitting on the back of the instrument and adjustable purge tubes that are compatible with almost all commercially available spectrometers. The purge volume is also quite small because of the ergonomic and compact design.